Trevino Brings Plenty is a poet and musician. He is singer/songwriter/guitarist for the musical ensemble Ballads of Larry Drake. He has read/performed his work at poetry festivals as far away as Amman, Jordan and close to his home base at Portland’s Wordstock Festival. For my latest collection, I listened to a lot of podcasts on new books in Native American studies. Also, I read articles about foster care placement of Indian children. These explorations directed me to gather stories from my family’s history; made me look at possibilities of different paths that could’ve been had. I started to talk with other Native American people and their experiences and found similarities in their history as with mine. This informed the work I created in my latest book. My creative process starts with a nagging urge either unprovoked or intentional. Unprovoked would be late night, before bed, social media inspiration. I find something on my feed and go forward with writing something related or completely not related to an article or idea. Since I’m poor speller and grew up in a family that certain words were not used due to education or class limitations, I would get sidetracked by having to see how to spell words. That would lead me on an etymological journey of word origin, which in itself would create other work possibilities and outcomes. This fellowship has allowed me to upgrade my computer setup, which helps fuel my creative aspirations with not just literature, but multimedia projects. I am in need of lots of encouragement and this award had been welcome dearly. I am currently working on poetry video projects, writing my next book, and delving back into my full score Native American Requiem Mass, which has almost ten years in the making. My advice for future applicants would be to keep trying. I’ve been applying on and off for over a decade. The speakers of Tervino L. Brings Plenty’s poems sing with the weary voices of the ravaged. 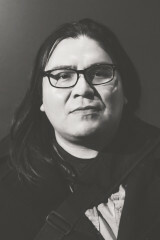 “We are eyes torn from bodies,” one says, in his poem, “Exiled.” His is a world where the modern and ancient are coterminous: a world of flat screens and burnt eagle feathers, slaughtered parents, dialysis machines, ghosts, thousand gallon propane tanks, and a half court shot that “won’t make it home.” Although life on the Native American reservation can be harrowing, the people’s stories–and histories–still matter. 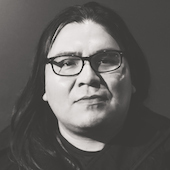 One narrator claims, “there is still melody in us,” while another tells us that “a thunderbird is life/ writhed to these bones/ borrowed from my grandfather/ wrapped in my skin.” In “Eagle Butte,” a speaker drives through his rez–his hometown–and rides past his childhood home, a place he claims was haunted, and where old “feathered warriors paced up and down the stairs.” At the poem’s end, this same speaker–like an improvising drummer–ends up beating a red whiffle ball bat against an abandoned truck canopy, while he sings “deaf into the wild.” Brings Plenty’s poems suggest that sorrow might be inescapable, but there’s a kind of vital and transformative magic to the songs we make. I hope he keeps singing.